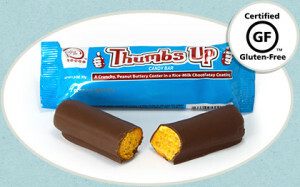 — a crunchy, peanut buttery center in a chocolatey coating. 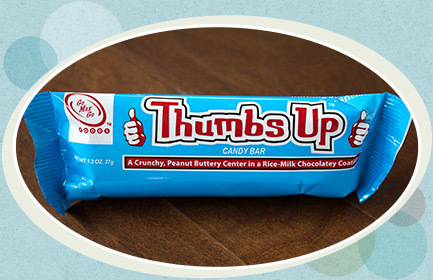 Are you searching for a candy bar that talks to you? One that’ll sass you back with a light, crispy cRuNcH every time you take a bite? 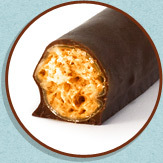 Does a bar with a flaky, sweet ‘n salty, peanut buttery center combined with our signature-recipe chocolatey coating sound totally tubular? Then dude, sink your chompers into a Thumbs Up™ — it’s the bar for you! 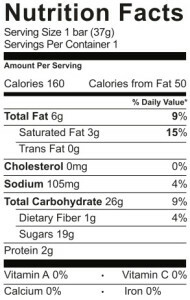 INGREDIENTS (VEGAN & NON-GM): CANE SUGAR, TAPIOCA SYRUP, PEANUTS (DRY ROASTED), ORGANIC UNREFINED CANE SUGAR, PALM KERNEL OIL, COCOA POWDER (NATURAL), SALT, SUNFLOWER LECITHIN, CORN STARCH, NATURAL COLOR, NATURAL FLAVOR, TOCOPHEROL (VITAMIN E). ALLERGEN INFORMATION: CONTAINS PEANUTS. NOT SUITABLE FOR CONSUMPTION BY PERSONS WITH AN ALLERGY TO MILK. 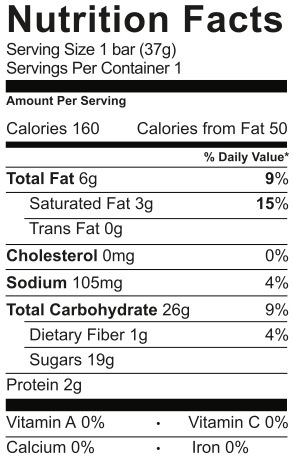 This product is manufactured in a facility that produces products containing dairy, eggs, wheat, soy, peanuts, and other tree nuts, therefore trace amounts of these ingredients may be present.